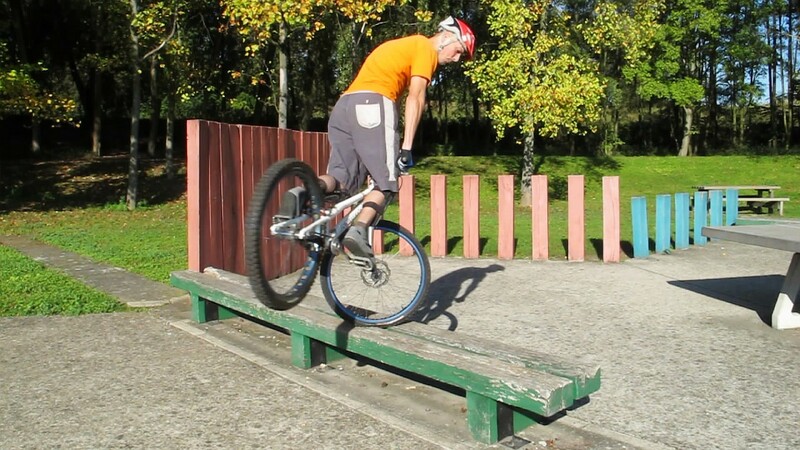 Beyond the basic pivot, turning 180 degrees or more on the front wheel requires a special focus on the bar spin. Turning on the front wheel is another game. 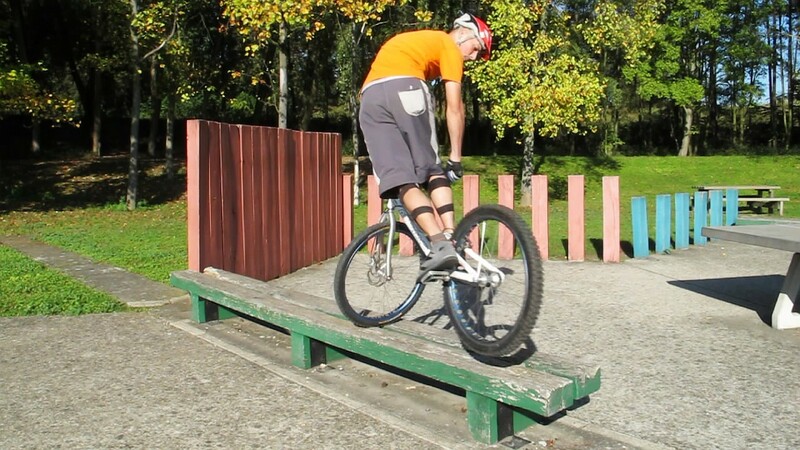 You must shift your centre of gravity above the front wheel axis to follow the rotation with your torso. Being well positioned over the front wheel axis is what allows you to turn smoothly, in balance right above the stem, without being destabilized sideways during the rotation. This technique is generally easier to learn when pivoting on your front foot side (that is, anticlockwise if you are right-footed, or clockwise if you are left-footed). Maintain a trackstand with your front wheel pointing in the direction opposite the rotation you want to initiate, so that you can switch the handlebars later and pivot with your inertial moment. Initiate a rotation with your torso, concentrate your weight over the stem, with your shoulders well over the handlebars. As you turn the bars in one swift move, follow the rotation with your torso until you can no longer twist your hips, you should end up leaning forward into a full extension. As you lean forward, tilt the bike onto the front wheel and swing the frame with your legs to push the rotation further, re-adjusting the frame in line with the front wheel. With the rear wheel lifted, keep your weight well above the front hub so that you don't get dragged sideways or lose your balance during the rotation. Friction will stop you from spinning fairly quickly, especially with low pressure in the front tyre. You can swing the frame past that point by twisting your hips to push the rear wheel further into the change of direction. 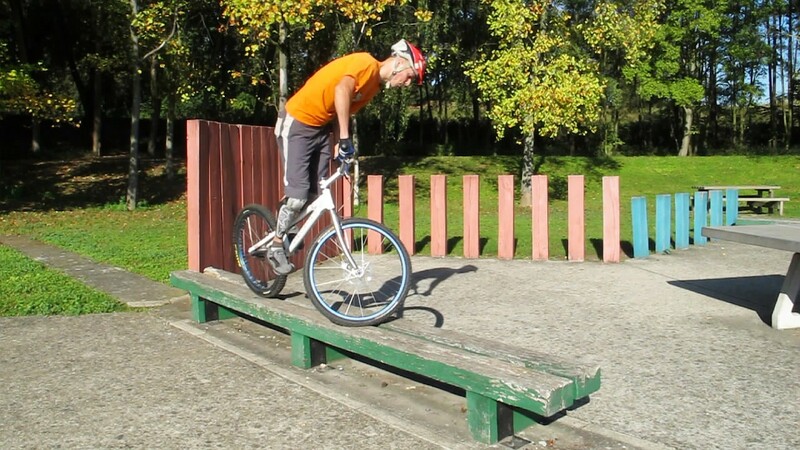 1° Maintain a trackstand with your front wheel pointing in the direction opposite the rotation you want to initiate. 2° Initiate a rotation with your torso, concentrate your weight over the stem, with your shoulders well over the handlebars. 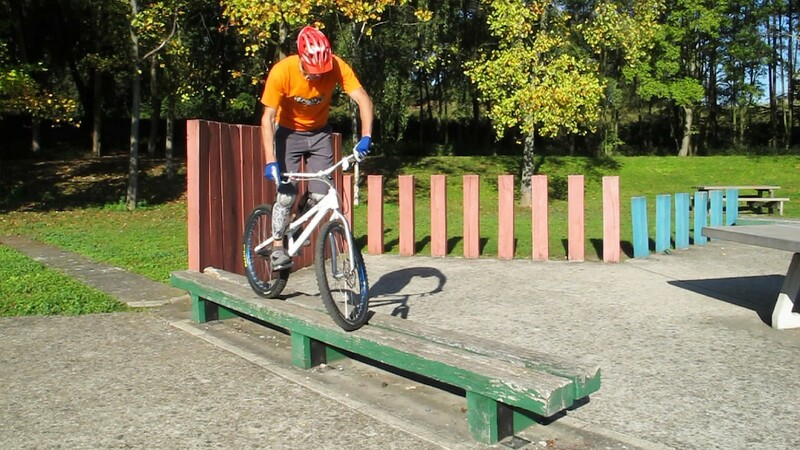 3° As you turn the bars in one swift move, follow the rotation with your torso until you can no longer twist your hips. 4° As you lean forward, tilt the bike onto the front wheel and swing the frame with your legs to push the rotation further. 5° With the rear wheel lifted, keep your weight well above the front hub so that you don't get dragged sideways. 6° Swing the frame past the alignment with your shoulders by twisting your hips to push the rear wheel further. You can stop the rotation at any time and with precision by shifting your weight over the back wheel again to stick the rear tyre down. Even with the brakes locked, the front wheel still rolls slightly when you tilt the bike, so make sure to take this into account, especially on narrow edges. 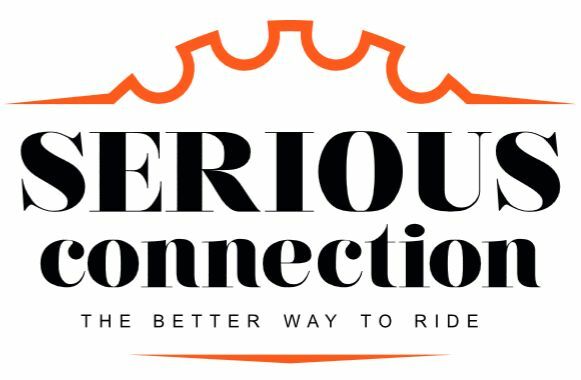 At the beginning, it helps to learn this endo variation at a slow pace instead of starting from a trackstand, but you will never get as much control because the bike inertia could destabilize you. It is better if you can control the whole move through pure body language. Pushing the front pivot to a full turn is really difficult and requires precise balance as you spin, but it is a nice trick for demos. It does help to learn in a mild slope, going upward. 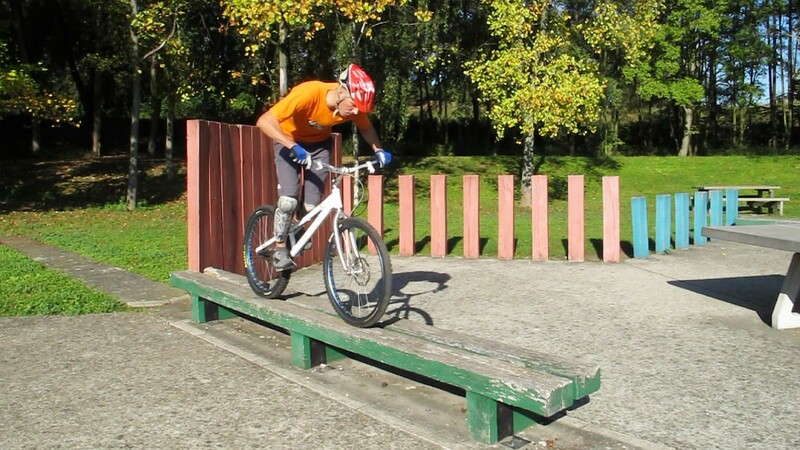 Pivot the first 180° up against the slope and finish with the rear wheel completing the turn down into the slope. Gravity helps you swing the rear wheel back down into the slope, compensating for your lack of rotational inertia after the first 180° swing.